A passenger airplane skidded off a snowy runway at LaGuardia Airport in New York City on Thursday morning, and federal authorities have suspended flights for hours to come over inclement weather. The plane, an inbound flight operated by Delta, “skidded off” the runway at the Queens, NY airport at around 11 a.m. local time, the city’s fire department confirmed on Twitter shortly after. Personnel and passengers were evacuated off of the plane, according to the New York Port Authority, and no injuries have yet to be reported. 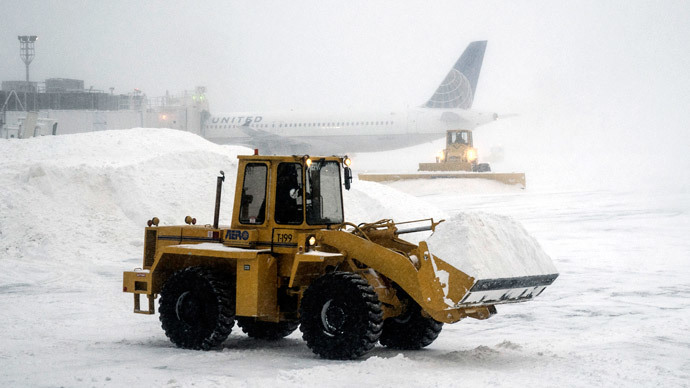 As snow and ice continues to cause problems at the major air hub, however, the Federal Aviation Administration told CBS News on Thursday morning that it has authorized a ground stop at LGA — one of the busiest airports in the United States — as flights across the northeast are grounded. According to the Associated Press, Delta said 125 passengers and five crew members were onboard the aircraft when the incident occurred. "Delta flight 1086 from Atlanta to New York-LaGuardia exited Runway 13 Thursday morning during landing,” the airline said in a statement. “Customers deplaned via aircraft slides and have moved to the terminal on buses. Our priority is ensuring our customers and crew members are safe. Delta will work with all authorities and stakeholders to look into what happened in this incident." Photos taken by eyewitnesses at the airport show that the plane skidded into a fence after landing on runway 13, and a local NBC News affiliate reported that only three inches of snow had fallen in New York at the time of the landing. Flights at LGA have since been suspended until 7 p.m. local time.